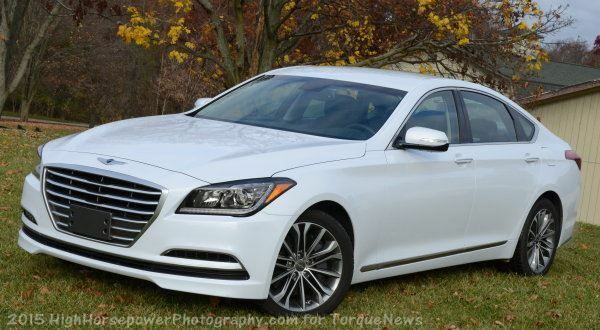 The 2015 Hyundai Genesis sedan with the V6 engine in its most basic form comes with a price of just $38,000 and while the price isn’t why the new Genesis sedan is so impressive, that incredibly low entry level price for a car that is so well appointed inside and out makes this the best bargain in the modern midsize luxury segment. I first drove the 2015 Hyundai Genesis sedan at the media launch in Arizona, at which point I fell in love with the top of the line Korean sedan with the 5.0L V8 and the premium Ultimate package. At just over $55,000, the 5.0L Genesis Ultimate is an incredible bargain – especially for a midsized luxury sedan with so many features and 429 horsepower – but not everyone needs 429 horsepower. Also, not everyone has $55k laying around to buy their new luxury sedan, so for those folks, Hyundai offers the Genesis sedan with a 3.8L V6 and a price starting at just $38,000. I want to point out that the incredibly low price isn’t why the 2015 Genesis V6 sedan is such an impressive luxury sedan, but the fact that you can get so much car for under $40,000 is remarkable. Anything comparable to the V6 Genesis sedan from Mercedes Benz or BMW is going to cost you at least $14,000 more, with the 300hp BMW 535i starting at $55,600 and the 302hp Mercedes Benz E350 starting at $52,300. Even if the Genesis V6 sedan started at $50,000 like the German competitors, it would be a worthy rival, but the $38,950 price out the door (including destination) is why it is the best bargain in a very large and very competitive segment. My 2015 Hyundai Genesis V6 test car was priced at the $38,950 base price and there were no other items added, so everything discussed in this review is included in the base price. The 2015 Hyundai Genesis sedan has a new look that has similar cues to the previous generation, but the new design is more upright, more angular and, in my opinion, an all-around better looking luxury sedan. Up front, the bigger, bolder grille design on the very upright front end is more in line with what you get from the German competitors. The sharp styling lines and the hard angles through the front fascia provide a very sporty look while the LED trimmed projection headlights bring that level of high tech appearance that is a must-have in the modern luxury segment. Behind those headlights is a big, flat front end with hard lines through the hood that lead to the tapering greenhouse, which gives this big sedan a very sleek look from the front. Along the sides, the Genesis has more upright styling, with just a sole styling line running through the door handles, presenting a very clean look from the profile view. Also from the side view, you get a great look at the sloping roofline that almost gives the Genesis sedan a fastback shape – something that a German company might call a Grand Coupe. The standard 18 inch aluminum wheels are both sporty, and classy, fitting the sport luxury sedan very well thanks to the thin spokes and the brushed silver finish. Out back, the Genesis V6 sedan continues with the clean sport sedan look, with thin, angular LED taillights underlined by LED backup lights. While there are some silver accents scattered across the front end side, the rear end takes the minimalist approach and it does so successfully, with the integrated exhaust tips and the vehicle logos being the only silver out back. Even with the lack of bright trim, the Genesis still has a strong, luxury feel across the back. For someone who is buying the 2015 Hyundai Genesis sedan with the V6 engine, the luxury level of the interior is likely the key component in making their purchase – and this is an interior that sells itself. Mind you, this is the base model Genesis sedan, so everything between the doors is standard for $38,950. The front bucket seats are heated and feature 12-way power controls, with soft, plush leather looking and feeling great, while the shape of the front seats are both comfortable and supportive. The side and base bolsters are present and they provide some support during cornering, but the center surfaces are wide enough to suit any back or bottom so unlike some sport seats, these wont squish bigger passengers. That same soft black leather is found on the center console, the door panels, the steering wheel and the rear seats, with the predominantly black cabin accented lightly with some wood trim and satin silver on the dash and doors. This isn’t a luxury car that slaps you in the face with chrome, but when riding in the Genesis sedan, there is never any question that this is a premium luxury model. More importantly, this plush interior is made comfortable by the fact that it offers an impressive level of passenger space in the front and rear. Whether you are seated up front or in one of the outboard rear seats, even taller folks will have plenty of leg, knee, hip, shoulder and head room, so this car would serve as a great option for a family of four driving across the country or for four guys headed to a football game. There is even a huge trunk for the family’s luggage – or the cooler full of frosty beverages for the festivities before the football game. Finally, the 2015 Hyundai Genesis comes with the type of infotainment package that you would expect from a premium luxury sedan including a big, bright touch screen mounted high on the dash that offers full control of the hands-free phone system, the navigation system, the climate control system and the sound system. This screen also displays the rear camera system. For ease of use, the entire HVAC system can also be adjusted via traditional buttons and knobs just below the touchscreen and below the climate controls is a simple panel with some basic control buttons and knobs for the stereo and navigation systems. Also, the Genesis steering wheel has a huge array of controls, allowing the driver to adjust the sound system, the cruise control system and the hands-free phone system without removing their hands from the steering wheel and the voice control button on the wheel allows the driver to make adjustments to the navigation system with ease. The only thing that I could ask for in the 2015 Genesis sedan is a sunroof, which is available as part of the $4,000 Signature Package, but from spaciousness to comfortable seats to the premium infotainment system, the “base model” V6 Genesis sedan interior doesn’t leave you wishing that you had spent a few more dollars. This interior won’t blow you away when compared to the German competitors, until you realize that all of this is standard for a price that is at least $10k less. The 2015 Hyundai Genesis sedan is powered by a 3.8L V6 that delivers 311 horsepower and 293lb-ft of torque, which is sent to the rear wheels via an 8-speed automatic transmission. This engine delivers more power than the comparable BMW and Mercedes models and, more importantly, this is plenty of power to give the Genesis sedan plenty of low end acceleration and a nice mid-range pull for higher speed passing. While I preferred the more powerful 5.0L V8, the V6 is plenty of power for the average luxury sedan driver to get all of the performance that they need for daily driving, so while it isn’t crazy powerful like the V8 Genesis – the V6 Genesis never feels underpowered. It will get away from a stop pretty quickly and it will reach speeds well beyond any posted American speed limits without much fuss. The standard 8-speed transmission shifts quietly and smoothly when set to the Normal driving mode, but when Sport mode is chosen, the gears are stretched a bit and the transmission shifts a little harder. There is also an Eco mode which adjusts the shift points for improved fuel economy and a Snow mode that is said to help traction in wintery conditions. I did not experience any wintery conditions, but I did get a chance to enjoy the differences between the normal and Sport driving modes, as Sport mode stiffens up the steering, the throttle response and the shift points for a more exciting driving experience. The V6 model does not get the adaptive suspension of the V6 models, but the standard suspension does a great job of mixing ride comfort with handling, leaning a bit towards ride quality –but still offering solid cornering abilities at both low and high speeds. In addition to offering a very smooth ride, the 2015 Genesis V6 sedan is whisper quiet, even when attacking the rough Metro Detroit highways which are riddled with crater-like potholes. You can feel that, but very little noise or road vibration makes it into the cabin, so in terms of that luxury ride – the Genesis answers the bell beautifully. Finally, the EPA expects that the 2015 Genesis sedan with the 3.8L V8 and rear wheel drive (all wheel drive is also available with the V6 engine only) should hit 18mpg around town, 29mpg on the highway and a combined figure of 22 miles per gallon. I found those numbers to be very accurate, as I averaged 21.8mpg combined, with the on-board diagnostics system indicating highway fuel economy numbers that hovered just south of 30mpg. For a car of this size with 311hp, I was very impressed at the fact that the Genesis sedan still averaged just under 22mpg, as I spent most of my drive time in Sport mode, playing with the paddle shifters to pick my own shifts. While the V6 includes far less power than the V8, that engine swap doesn’t make the 2015 Hyundai Genesis sedan any less impressive to drive. The interior is very quiet in any driving situation, and while it doesn’t pack the all-out acceleration of the 5.0L V8, the V6 Genesis still offers solid handling that makes it a fun car to drive. Driving dynamics were a focus of the new Genesis sedan, and the V6 model is a sign of success from that focus. If you want a roomy midsized luxury sedan that is every bit as well appointed as any car in the segment, and you aren’t worried about having an expensive brand name on the front end or a high performance engine, the 2015 Hyundai Genesis V6 sedan is your best choice on the market today. This car at just $38,950 brings with it everything that you get from the comparable Mercedes Benz or BMW that have prices well into the $50k range. If you want to brag about owning a German luxury sedan, go ahead and pay $14,000 more for a comparable vehicle from BMW or Mercedes. If you want the most luxury for your money and you don’t care if the brand name impresses your neighbor, head to your local Hyundai dealership today to drive the V6 Genesis sedan. Also, if you are looking to spend $50k for your new midsized luxury sedan, you can check out the Genesis with the 5.0L V8, which includes all of this luxury and 429hp for the price of the 300hp German models. The 2015 Hyundai Genesis sedan proves that you can have premium luxury without paying a fortune, even with a high performance engine. I love the Genesis with the 5.0L V8 because I love high powered sedans, but for those who aren’t interested in that big power, the 311hp V6 Genesis sedan does and offers anything that you can get from the German competition for thousands less. This car is a rolling illustration of why the Hyundai brand is doing so well in the US market, as the company has maintained bargain pricing – even when competing with high end luxury brands. Have a first generation Genesis, made the move from a 5 series BMW. Got tired of paying for leather, rear sun shades, and now they have a standard 4 cylinder turbo in the 5 series BMW, more for heated seats, and all these options that come standard on the Genesis and work great. The Lexicon stereo is the best in the business, only in one other car, the Bentley Arnage. Transmission, ZF, same brand as the BMW 5 series uses. The 5.0 R Spec does 0-60 under 5 seconds. The number one thing that you don't get with BMW, MB, Audi, and all the other luxury brands though is 5 years, 60 Thousand Miles Bumper to Bumper Warranty. Why can't the other luxury brands back their cars for 10-20K more? My oil changes are now about $28.00 versus $120.00. My car has every option, will blow the doors off any 5 series other than the M and I can actually afford another one for my spouse for the same price. Plus there is more room and the car is more comfortable. The Germans are heading back to the drawing board, there is a new Sheriff in town. Going to retire a few years early saving all this money and having so much darn fun driving this beast. Surprised a few youngsters in their Mustangs at stoplights already. What a blast! Already planning on getting a new one in a few more years. Do yourself a favor, go drive one, then comment. Yes, it's a Hyundai, but boy have they raised the bar. I have this thing's baby brother, the 2015 Sonata. I like the car, but while it's absolutely stunning value, I wouldn't mind an upgrade (the stereo is good but not great, and the same goes for acceleration and general poise. It's a gobsmacking value but there's only so much you can jam into a car that rolls off the lot for 21k). When my lease is up, this thing is definitely going to be on the list. I cross shopped Mercedes E350 and the BMW 535I. While both are excellent vehicles, the $16k and 20 k, respectively, for a comparable match to a Genesis , is not worth it. Unless the badge is an aspirational goal, save the cash. In my area of Florida, where literally every third or fourth car is an MB, BMW, Audi or Lexus, it's nice to have something different. Most of my neighbors thought I had purchased a Bentley.they were stunned to find out it was a Hyundai. Having owned several luxury brands, I decided to see what all was out there when searching for a new car instead of the same bands usually on my radar. And I AM SO GLAD I DID. I went to an auto show, unaware that the Genesis had been redesigned. I thought the first generation was attractive, but just wasn't on-board with Hyundai yet. At the auto show there was this car that immediately caught my attention. It had a sleek prowess to the design and the interior was amazingly luxurious. When the representative told me I was in a Hyundai Genesis, having not seen the rear badge yet, I was stunned. It was my favorite of the show. It is such a man's sedan. The auto show passed and this car was all I could think about. I test drove one about a month later and discovered it was everything I wanted in a vehicle. Comfort, Power, Amazing Sound System. Design. I could go on and on. It made me nervous to by a Hyundai at first, but the warranty spoke volumes about their own confidence in the product. I have not given it a second thought since. I am in love with this. I could not recommend it more to a buyer out there comparing true value received when buying a vehicle. If you are a traditional brand buyer, you might not be able to do it. I understand your point of view. But it is worth a test drive. My family thinks I am nuts for going on and on about my Genesis saying that it must be my favorite car I have owned. They are right! I own a first generation Genesis and I actually prefer the looks of mine over the newer ones. The second generation Genesis looks too much like a Ford Fusion. I can hardly tell them apart. But my 2009 model has a more classic look reminiscent of an E-Class Mercedes. In reality I suspect it is actually a better car than the Mercedes and at least one automotive review which compared the two gave the Genesis higher marks. Really, I'm not kidding. Hyundai now has excellent reliability ratings, whereas all the German brand luxury cars are noted for breakdowns and maintenance issues. I've had my car on many road trips and it is a joy to drive. I've got the V8 model with the 4.6 liter engine and it's a rocket. Step on the gas and you have no problem passing anyone on the road. I can blow the doors off most sports cars or expensive German sedans. And it has all the creature comforts you could ask for, except possibly the chilled bottle of champagne you'd expect to find in a secret compartment on a Bentley. If you want a great luxury car at a reasonable price, do yourself a favor and leave the snob appeal factor of the Mercedes or BMW logo at the curb and test drive the Genesis or its big brother, the Equus. Hyundai has come a long, long way in the past decade and they are now producing cars that can compete with anything on the road. And if you just can't get over your resistance to the idea of wearing the modest Hyundai badge, you can easily rebadge the car with the Genesis wings logo that resembles the wings seen on a Bentley. I just purchased a 2015 Hyundai Genesis Ultimate AWD with 2,995 miles on the clock. I think I got a great deal, with the car having a $52.450 MSRP, I bought it for $36,500, almost $16,000 off sticker for a virtually new car. I can't find another AWD with the Ultimate package for anywhere near that price with mileage like this. I live in Michigan and found it in Pennsylvania, and had it shipped for $250. I just bought it, so time will tell, but I expect greatness. I've owned Mercedes, Jaguar, Cadillac etc. and this car looks great.